In Richmond, California, by san Francisco Bay, Robert Henrikson, CEO of Smart Microfarms, has been developing a series of simple scalable platforms. Robert was a founder of Earthrise, which became the world’s largest spirulina farm in the 1980s, still producing today as Earthrise Nutritionals in Imperial Valley California. Having pioneered big commercial farms 35 years ago, the time has arrived for small scalable algae systems. Smart Microfarms shows several home growing systems: indoor aquariums, outdoor deck growing modules, and a 4×8 backyard micro pond which is scalable to a community greenhouse. Demonstrating a simple harvesting method through a microscreen, freezing fresh spirulina paste into ice cubes, later melting a cube in fruit juice for a fresh green drink. 2:08 minutes. A demonstration of simple home and backyard systems for growing and harvesting spirulina (2012). 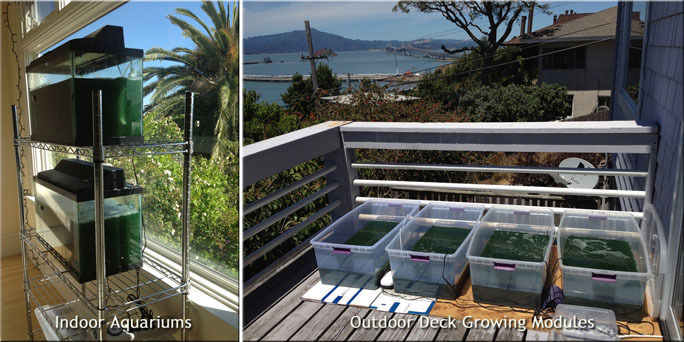 Aquarium tanks by the window and ouydoor modules on a deck overlooking San Francisco Bay. a 3M2 backyard micro pond. Harvesting fresh spirulina paste.